What makes GATE Premier Solutions different? Each year, Inc. 5000 ranks companies according to the percentage growth of their annual revenue over a three-year period. This achievement puts GPS in an elite group that, over the years, has included companies such as Microsoft, Timberland, Vizio, Intuit, Chobani, Oracle and Zappos.com. It also shows that, despite the downturn in the oil and gas industry, GPS continues to endure through dedication to their Clients and the quality of the people they provide to the energy industry. The PFC: Digital Facilities Engineering - No Document Left Behind Luncheon is around the corner! On Tuesday, February 23rd from 11:00 am to 1:30 pm GATE Premier Solutions will be sponsoring the luncheon provided by SPE at the Hess Tower. Speaking on this topic will be Jim Crompton, who retired from Chevron in 2013 after almost 37 years with the company. 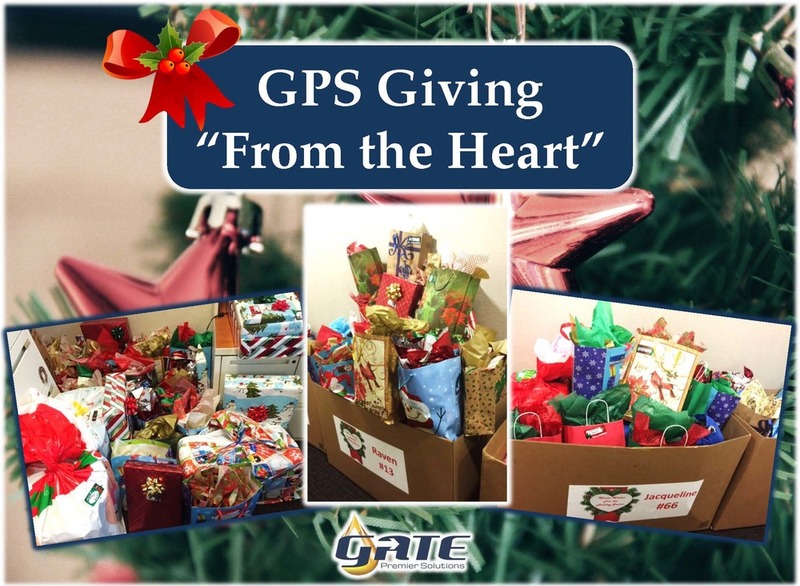 This holiday season GATE Premier Solutions took part in the Tri- County Behavioral Healthcare From the Heart campaign. In doing so they provided the wonderful gifts of clothes, shoes, and most of all the hope to families this holiday season in surrounding counties. These items were placed in the hands of four different families and with the contribution of GPS and others, $2,405.00 will go towards the overall total for the From the Heart campaign. Year after year, Tri-County Behavioral Healthcare supports their clients and families by providing clothes, food, and gifts, giving them a holiday they would otherwise not been able to afford. In 2014 they helped more than 1,225 of their clients and families, and this year they have exceeded that goal and will give 1,785 individual requests for holiday assistance. GPS could not be more humbled by the act of giving and being a part of something so special within the community that surrounds them in The Woodlands. GATE, Inc. and Gate Premier Solutions have teamed with The John Maxwell Co. for internal leadership training. It is our goal to have all of our internal staff to receive this valuable training. The 5 Levels of Leadership: Proven Steps to Maximize Your Potential is the basis of the corporate training program. #1 New York Times bestselling author John C. Maxwell explains how true leadership works and makes it accessible to everyone. Leadership does not come from your title. In fact, being named to a position is only the first and lowest of the five levels every effective leader achieves. To become more than a boss people are required to follow, you must master the ability to inspire and build a team that produces not only results, but also future leaders. For more information about him visit JohnMaxwell.com. Since joining the ISNetworld in early October 2014, then Champlain Group now GATE Premier Solutions, has completed the initial review and completed all requirements for Anadarko Petroleum Corporation. GPS is proud to announce that our company’s grade was an outstanding “Above Average” under all categories and programs turned in for review. ISNetworld connects hiring clients and contractors together, which in return establishes a safer work environment and lasting partnerships. Hiring clients use ISNetworld to regulate contractor management across multiple job sites and geographic regions, clearly communicate requirements and expectations and exchange data with other internal systems. As a result there are lower incident rates and higher compliance numbers. When it comes to HSSE, GATE Premier Solutions’s alignment is a critical success factor within every aspect of our company. HSSE not only adds value, it ensures that everyone is reading from the same sheet of music, that we share the same HSSE objectives, same HSSE vision and same HSSE goals. Our team made it to the finish line! But this was never just about 4 riders going 142 miles on bicycles from Houston to Austin on a weekend in April. Finishing was NEVER in doubt because your thoughts, prayers, and support ensured a level of commitment that did not allow for anything other than a successful completion of the goal. We sincerely thank you for participating with us. Together we have raised over $7,000 that will benefit those suffering from Multiple Sclerosis and to find a cure. Total contributions from 14,000 riders and companies were $15.1 million! We started our cycling journey Saturday just after 7 in the morning from Waller, TX. Our biggest concern was the projected 18mph headwind that would surely have a big impact on the bike ride. While the constant wind in our faces certainly added to the challenge of the day, we were pleasantly surprised when we finished the 74.2 mile, just before 4 in the afternoon… This headwind was the strongest the MS 150 has seen in the last 7 years of riding. We heard stories about sag wagons (wagons that picked-up cycles along the way) with signs posting "Full" marked on the windows. Ultimately the organization had to revert to school buses to accommodate the amount of stranded riders. Our support crew was tremendous!! Melissa O’Shea, Nicole Quinn, Christopher Heiskell and Delaney Heiskell were a God-send. Our Sunday strategy was to ride the 68 miles together as a Team through the finish line in Austin, TX: cycling through the middle of Texas in the rain on a 2-lane country road, it was more than comforting but very challenging. As we expected, the finish line was a sight for sore eyes and legs, yet a surreal experience. We all were thrilled to have come so far in support of the many that suffer from MS.
We thank you for all of your support, thoughts, prayers, and financial contributions. This has been a truly rewarding experience. Champlain Group donated and had fun volunteering for the Special Olympics track and field event in Willis, TX. We want to congratulate all the athletes! We encourage your support of the programs that benefit Special Oympics, please get involved! SPE is holding a Final Commissioning and Initial Startup Conference in San Antonio, Tx. The conference starts on February 5th and concludes on February 6, 2013. In the final commissioning and initial startup (FCSU) phase of the project, the work of multiple teams over several years finally culminates in production. Though oilfield facilities are similar, there are always differences in technical details between projects. The goal of the FCSU workshop is to help address unique challenges. The workshop agenda is organized to maximize audience participation and minimize presentation time. This workshop will bring together experts to discuss the challenges, lessons learned, and recent advances. Champlain Group, Inc has been a sponsor of this conference for the past 2 years and will once again host an evening reception. CGI Launch of New Website! "Our relationship with ExxonMobil has been the core of our business, we are pleased to renew this commitment and to see it expand globally" states Alicia Heiskell, Vice President.